Before the World Cup, Uruguay was worried about Luis Suarez's knee and Colombia was fretting over injured Radamel Falcao. Considering the wild celebrations Thursday, neither should have. Less than a month after surgery, the incomparable Suarez came back Thursday to score two vital World Cup goals, and Colombia is through to the second round despite missing its star striker. Both South American teams won 2-1 Thursday, Uruguay pushing England to the brink of elimination, and Colombia beating Ivory Coast to advance from Group C after Greece and Japan played to a scoreless draw. The results further underscored South America's dominance of the World Cup in Brazil. The continent's teams now have seven victories out of a possible 10. Colombia continued to produce goals and victories even without Falcao. 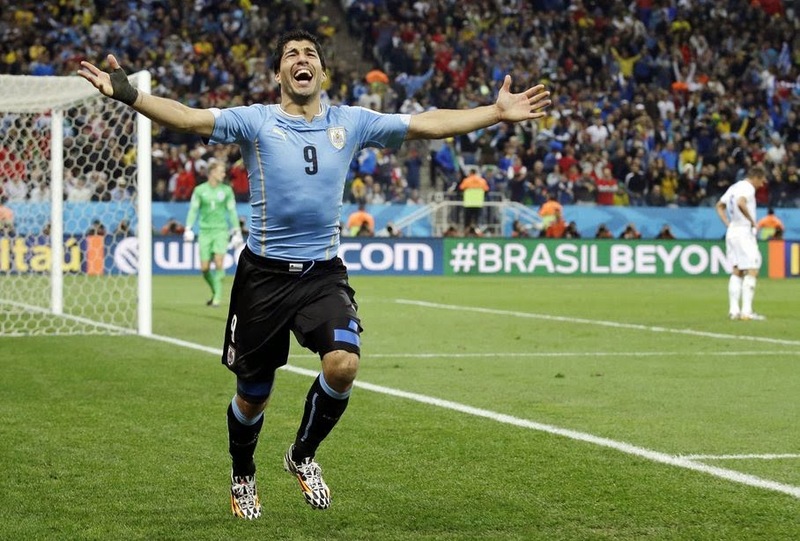 For Uruguay, Suarez reinvigorated its campaign after an opening 3-1 loss to Costa Rica. Uruguay is level with Italy and Costa Rica in Group D, and those teams meet Friday in Recife. About 15 miles from the site of the Uruguay-England game in Sao Paulo, about 2,000 people protested against the World Cup, some smashing windows at banks and car dealerships and spray-painting anti-capitalist slogans on buildings. It was the latest protest to hit Brazil, which has seen hundreds of demonstrations in the past year by people expressing anger about poor public services, corruption in government, the billions spent to host the World Cup and a litany of other complaints. 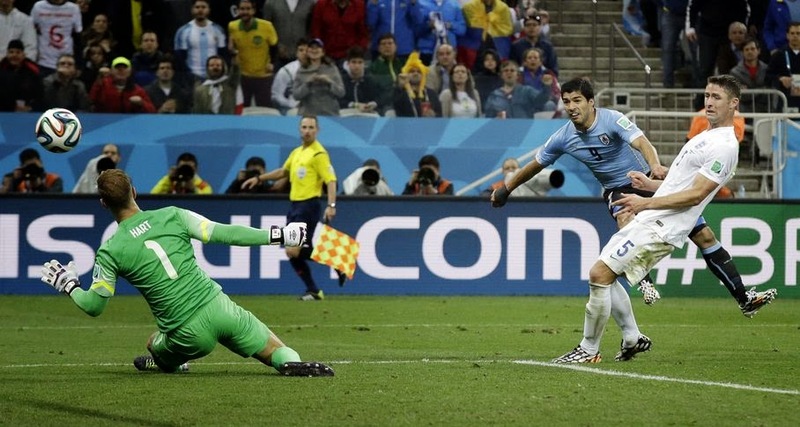 Inside the stadium, Suarez was hoisted aloft by teammates after the game as if he had won the World Cup. "I dreamt this. I'm enjoying this moment, because of all I suffered," Suarez said. Earlier in the tournament, stars have been coming through for their nations: Neymar for Brazil, Robin van Persie for the Netherlands, Thomas Mueller for Germany and Lionel Messi for Argentina. Suarez got started later, but he made up for missing a game with his star performance Thursday. After May 22 surgery on his knee left little hope for a World Cup appearance, Suarez looked completely healthy. He produced his toothy smile even before his header crossed the line to open the scoring. And after Wayne Rooney finally scored his first World Cup goal to tie the game for England, Suarez capped his return with something almost magical in Sao Paulo. 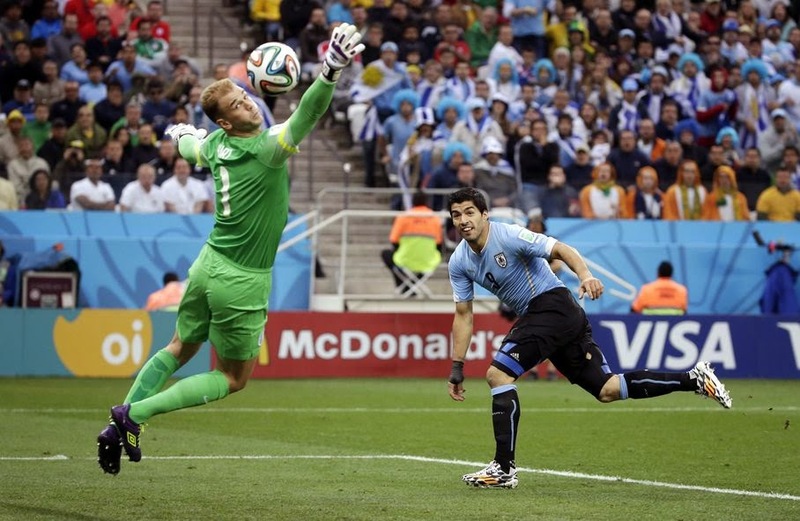 With Uruguay under intense pressure in the 85th minute, Suarez gathered a long clearance that was accidentally headed on by England's Steven Gerrard - his Liverpool teammate. His knee was in full flow as he unleashed a drive that goalie Joe Hart barely had time to see fly by. Suarez fell to the ground in disbelief before he was mobbed by delirious teammates. "He doesn't miss" from there, England coach Roy Hodgson said. 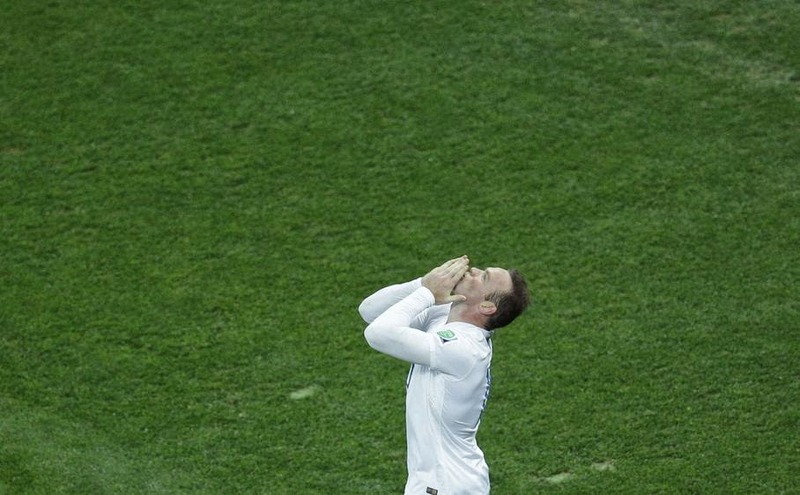 For England, its World Cup standing is slipping ever more. After reaching the quarterfinals at the 2006 World Cup in Germany, England exited in the second round in South Africa four years ago. Now it likely looks like a return ticket in the first round. "Our chances are unbelievably slim," added Hodgson. If Suarez produced tears of joy, there were also tears of anguish. In a moment as memorable as many of the great goals, midfielder Serey Die sobbed uncontrollably during the Ivory Coast anthem. His thoughts went back to his father who died a decade ago, but "I also thought about my tough life - I didn't think that one day I would be here, playing." The match provided little joy though, as the 2-1 loss of the Ivory Coast's chances to advance in doubt. Africa has had a miserable showing at the World Cup, with just 4 points out of a possible 21. For South America, the home advantage was there for all to see by the frenzied pro-Colombian crowd inside the Estadio Nacional in Brasilia. James Rodriguez and Juan Quintero produced second half goals before a brilliant solo effort by Gervinho made it a tight game again. There was nothing brilliant as Japan and Greece played to a goalless draw in the late Group C game, maintaining slim hopes of advancing for both.